Summer is almost over but Restaurant «Turandot» has several SURPRISES special for YOU! Coming up! 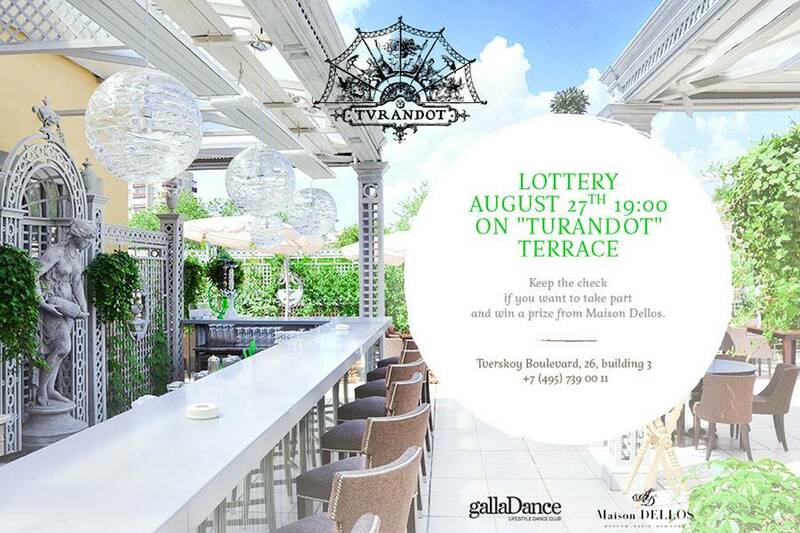 A LOTTERY on the summer terrace «Turandot», on August 27! To participate in the lottery you only need a restaurant bill with your name on it by that day. The warm atmosphere of our Trellis Terrace welcomes you, along with pleasant music, refreshing cocktails and dancing shows from the leading dancing club teachers GellaDance. You might become the lucky winner of prizes from Maison Dellos! Read more about the prizes in social networks. The most tender Tapas from our chief – Dimitry Eremeev will make the dinner on the roof of an antique villa in downtown Moscow truly fabulous. We look forward to seeing you! Keep up with all our news!